Happy Chinese/Lunar New Year!! 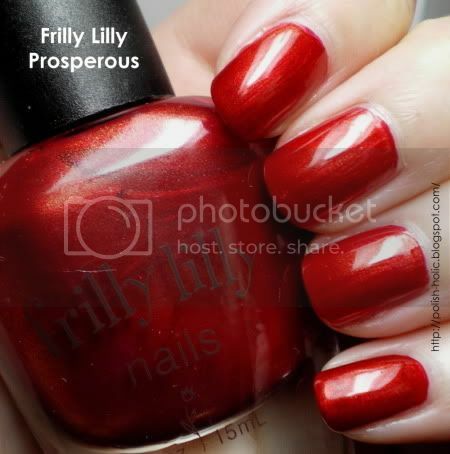 Last year I got a chance to review Frilly Lilly Prosperous. But I didn't do the application so I couldn't say anything about it. I finally put it on myself so here's my full review. As I said last year, Prosperous is the perfect CNY mani. And it's called Prosperous, there is nothing more CNY than that name. Too awesome. This is a blue-based red with gold shimmer. The gold shimmer doesn't show up but it does lend a warmth to the red. Making it an almost bricky red in lower lights. It never crosses into the land of warm, but it does have a nice depth. Anyhow, here's the pic. I swear, my middle finger does not like the polish. I just keep smudging it. Although this time isn't as bad as last time. Two coats with topcoat. Applied very smooth and even without issues. Thin brush that fans at the end a little like Rescue Beauty Lounge brushes. 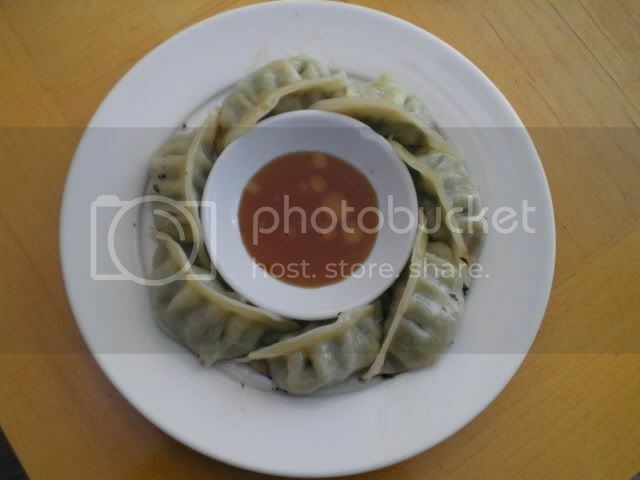 Pic of the Moment: I present to you pan-fried dumplings, aka potstickers, aka gyoza. Oh so very good. I like to dip them in a mixture of sushi vinegar, soy sauce, and sesame oil. I know, it's odd, but so good. Now have a pic of the moment bonus song. When I'm having a bad day, feel stressed, need a pick-me-up or just want to relax, I listen to this song. I love it. So soothing, but with good energy at the same time. Please enjoy. Very pretty! Indeed it is perfect for Chinese new year. this is so cute! frilly lilly.. im such a sucker for cutesy names! Gyoza is my go to comfort food. sushi vinegar & sesame oil FTW, but I also like sprinkling a little bit of Furikake on there too! Cathryn: Yeah, cutesy names will be my downfall. I'll sometimes buy a polish just because the name reminds me of something. Anna: Really? I never met another person who ate it that way so I thought I was odd. Good to know! Jeanie: I don't think I've ever tried Furikake before. Oh, PerryPie, you must, you must! You can get it at T&T!